Kichinosuke sends SHIMAZU Nariakira the clothes that AKAYAMA Yukie wore in his last moments. 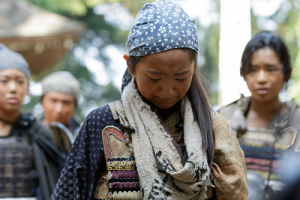 Nariakira sees the bloodstained clothes and then decides to make his father Narioki resign his post. Narioki who later grants an audience with TOKUGAWA Ieyoshi, the 12th shogun and is given a famous tin that stores tea leaves. It means that he should resign and enjoy the life after resignation. Then Nariakira visits him and hands a gun to him. In the gun, only one bullet id loaded. Nariakira pulls the trigger first but there is nothing. Narioki receives it from his son but he cannot hold it because of fear. He gives up this "Russian roulette" and Nariakira becomes a new lord of Satsuma domain. It makes Kichinosuke and his friends included OKUBO Shosuke happy. "Children are the treasure of the country". However, Shōsuke has not been permitted to work at Tsurumaru castle yet. And Nariakira still gives the vassals who served Narioki directy important positions. ARIMURA Shunsai is angry with it but Nariakira believes it's the way how a lord should be. One day, it is announced that a sumo tournament will be held in the presence of Nariakira. Kichinosuke then attempts to win it and ask Nariakira to pardon those who are still exiled or confined to their houses O-Yura Sōdō, a dispute over supporting Nariakira. Needlass to say, ten bales (straw bags) of rice given to the winner also attracts him as his family is poor and do side job to make living. IWAYAMA Ito has a friendly feeling towards Kichinosuke but she is told to marry EBIHARA Shigekatsu by her father. 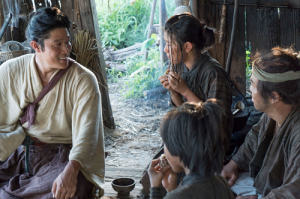 He has no opinion of his daughter visits the house of Shōsuke and talks with Kichinosuke. She hesitates to judge whether she should marry him or refuge it. Kichinosuke is strongly attracted by his new lord. But things don't go the way he wants because Nariakira has an opinion of his own. Anyway, he decides to participate the tournament and there he meets a lady who cheers for him. The scenes in Amami Oshima and Okinoerabujima Island were shot on location. 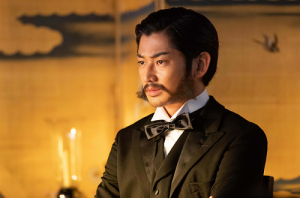 Ryōhei Suzuki said that it was a tight schedule but he gives an excellent performance as Kichinosuke who is exiled and disappointed but recovers himself thanks to Aikana. During the shooting, he celebrated his 35th birthday. In the image below, he holds a birthday cake presented by the crew. 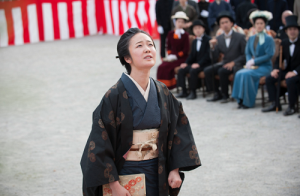 An actress who stands on the right of him is Fumi Nikaidō who plays the role of Aikana in the series. 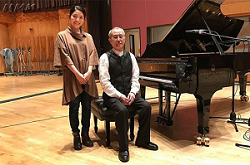 And Yōsuke Yamashita who is a famous jazz pianist acts a doctor in the episode 1. (Please see Sego-don Review 2 Kokichi and Nariakira or Sego-don Epidode 1) He also composed a background music for "Sego-don Kikō", a travelogue that introduces the cities where the series are laid in. In the image, he sits by the piano. Though he was born in Tokyo, his great grandfather was from Satsuma (Kagoshima) and made efforts to establish modern police system. The images are from the Instagram of "Segodon". Though Kichinosuke decides to protect those who are smaller or weaker than him, he is slashed by ODA Eisaku of Hirano Gochū. It's the revenge for his Gochū's win in Myōenji Mairi and he is wounded in the right shoulder. 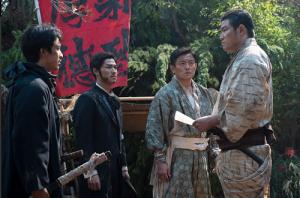 Later Eisaku visits the Saigō family with his father and he tells his son to commit hara-kiri because slashing people in Gochu is prohibited. And Eisaku slashes a boy whose status is lower than his. But Kichibei, father of Kokichi makes an abject apology to the father and son and tells them it takes two to make a quarrel. Kokichi is vexed when he sees Eisaku smiles with an air of triumph. Kokichi cannot handle sword any more. It disappoints him that he has no chance of serving the lord directly to protect him by his swordsmanship. Though he decided to support the weak, the wound handicaps him now. One day he climbs up the hill and sees SHIMAZU Nariakira enjoys hunting with Hisamitsu. Then Kokichi appears in front of Nariakira. He is surprised with him and says it's so dangerous. Kokichi who is disappointed with the wound tells him that he doesn't want to live any longer and wants to know what "Cangoxina" means before his death. 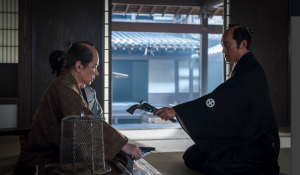 Nariakira tells him that the period of the samurais with the swords will end soon and a real samurai is the man who listens to what the weak say and works for the people. He then says if he should become stronger in the future, he will meet him again and leaves there. Needless to say, there is no record that Narikira was in Satsuma at that time as he was in Edo in reality. But his words encourage Kokichi and he and his frieds learn what "Cangoxina" means from AKAYAMA Yukie later. Then they climb Mt Shiroyama and sink "Cangoxina" into a stone. When I watched the episode 1, I thought the scene in which Kokichi sinks the letters into a stone will be an advance hint for the final episode. Kokichi who hopes to protect the weak is handicapped and thinks it's unreasonable that his father makes an abject apology because of his family's status is lower than that of Eisaku. Anyway he has to abandon his dream of serving the lord directly. 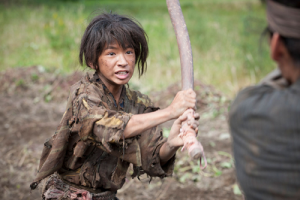 This may be the first Taiga Drama series that describes the wounds of Kokichi. And a physician who examines Kokichi is an ancestor of Yōsuke Yamashita, a jazz pianist and he plays the role in the series. But he meets Nariakira accidentally and it decides his future. "The weak", "the people", and "the children are assets to the nation" in Nariakira's words inspires him and working for the weak and the people and educating children become his policies later. And the end of the period of samurai with the swords gives him who cannot handle any sword a supportive push forward. And in the episode 2, he makes efforts to save a girl called Fuki. 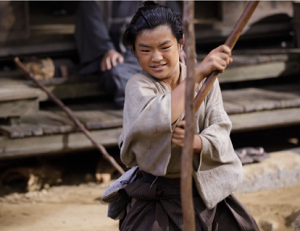 In the episode 1, IWAYAMA Ito hopes to study and practice swordsmanship but she cannot because she is a girl. Then she intends to join the boys of Shimo-Kajiyamachi Gōchū includes SAIGŌ Kokichi, later Kichinosuke and Takamori. As in Sego-don Epidode 1, gōchū is a unit of educating the boys of samurai families in Satsuma domain so she disguises herself as a boy and joins them who go to Iso Goten, a villa of the Shimazu clan to get sweets secretly. It's the suggestion of ARIMURA Shunsai, later KAIEDA Takeji but they are found and chased by the guards. They includes Ito who runs so fast escape to the top of the hill. There they find Tengu who is SHIMAZU Nariakira in reality. Nariakira examines a cannon there so the boys try to escape but only Shinpachi cannot move and is caught by "Tengu". Nariakira tells Kokichi if he really wants to be a brave man, he should not leave small Shinpachi. Then he gives them some pieces of castella wrapped by the paper on which "Cangoxina" is written. He sees the letters and remembers the words of Nariakira later. After that Myōenji Mairi is held and Kokichi's gōchū wins the race thanks to Ito who also joins it. "You will not understand how I feel because you are not a girl!" Kokichi tries to understand how Ito feels by disguising himself as a girl and what he experiences is quite strange to him. But his father Kichibei appears and scolds him. 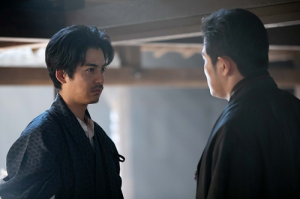 Kichibei learns that his son wants to serve the lord directly but admonishes him it's impossible to do so for a low class samurai like him or his son. Kokichi decides to overcome his handicap. 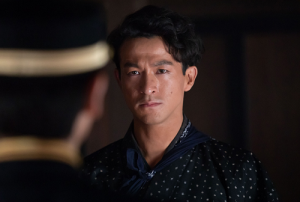 The images are from the official website and Instagram of "Segodon"
At the end of last January, the official website and the accounts of twitter, facebook and Instagram of "Segodon" were deleted like those of other Taiga Drama series. There were interesting photos on the website and other SNS sites. The below is the one of them. 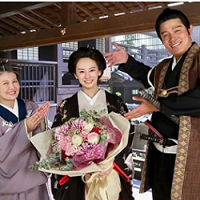 In this photo, Ryōhei Suzuki presents a bouquet of flowers to Keiko Kitagawa as Tenshō-in after her last appearance in the series. Presenting a bouquet to an actor or actress is an established custom when he/she finishes shooting. Needless to say, such photos are one of the PR plans of NHK. Not only presenting the bouquets, many of the photos of the cast in the green room (or dressing room) were posted also. Though some of them oppose in the series, they are on good terms in the room. In some photos, they seem to be really relaxed but in the others they become tense. Despite being the "unposed" photographs, the actors or actresses sometimes strike a pose responding to a photographer's request. Not only on the SNS sites, they in the room are introduced in a special programme of the series also. 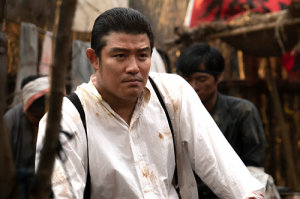 In it, Suzuki talks about how he gains weight with Tetsuji Tamayama as KATSURA Kogorō. 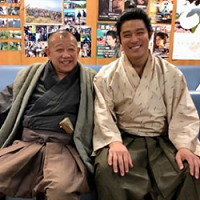 In November 2018, Ryōhei Suzuki, Eita and Kōkichi Tanoue are invited to Kagoshima Ohara Festival held on the 2nd and 3rd November in Kagoshima City. At that time, many people invite them and the sides of the streets were crowded with people. And a talk show was held also as in The Cast, the Events and the Programmes. 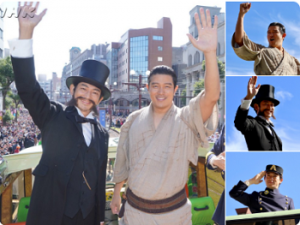 But on the previous year, Suzuki and other cast also joined the festival. In November 2017, Suzuki, Muga Tsukaji, Yukiya Kitamura, Shūichirō Masuda, Arata Horii and Munetaka Aoki joined the festival. They wore happi coats and danced as in the image below. Though the broadcast of "Sego-don" started in January 2018, the series became so familiar for the people in Kagoshima already in autumn 2017. It seems Suzuki and Tsukaji are so happy with dancing together with the local people. The images are from the twitter and Instagram of "Segodon". "My father was like Mt. Sakurajima". 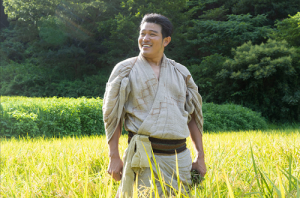 Takamori searches for uncaltivatd land and travels with Kikujirō. 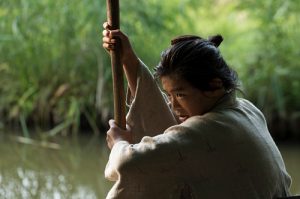 When he soaks in a hot spring, he learns that an unbelievable thing happened in Shigakkō. Nao-o Nakahara who is a spy of the government is tortured and some staff and pupils attacked the government's armoury. Takamori returns and scolds them. "What you did is a rebellion against the government". He says to Takamori that there is no place for them in Japan established by Toshimichi. Takamori advises them to go to Tokyo and make a direct appeal to the government. Kikujirō who hears the words understands what kind of person his father is. Takamori calligraphs "Kei-ten, Ai-jin" (Respecting Heaven, Loving People) before his departure. In February 1877, Takamori and his comrades depart for Tokyo. The party has 13.000 at all. But Toshimichi asks SANJŌ Sanetomi and IWAKURA Tomomi to obtain the Imperial sanction to suppress them. Then Takamori's party is regarded as rebel army and they are attacked in Kawashiri. So they are forced to resist the Government army and have a fierce battle against it in Tabaruzaka. During the battle, SHINOHARA Kunimoto is shoto and dies. And Kohei also dies while his platoon retreats. 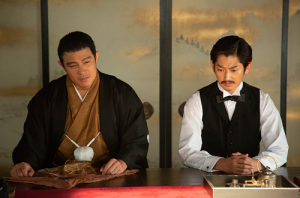 Jūdō (former Shingo) who is an army officer attempts to return to Kagoshima to fight with his brother but is opposed by his wife Kiyo. Ōyama Tsunayoshi is imprisoned in Tokyo because he is thought to take part in the rebellion and it's decides that he will be executed. Toshimichi who visits him says that he should not keep Takamori alive. Tsunayoshi tells him that he and ARIMA Shinshichi who died in the Teradaya Incident will wait for him in the next world. Kikujirō leaves from the front line to amputate his wounded right leg. And Takamori's army flee to Hyōno, Miyazaki. He then dissolves his army. Ito visits him secretly and speaks honestly that she wishes if her husband were an ordinary man. Kikujirō who is a mayor of Kyoto in 1904 is asked by Ryūjirō how Takamori felt at the point of death. "He who was a big person with passion. He hugged the samurais who couldn't keep up with the changes and swallowed and took them", says Kichijirō. Takamori and his followers return to Shiroyama and Takamori finds a stone on which he inscribed "Cangoxina" in his childhood. But Shiroyama is surrounded by the Government army. Kikujirō returns home with Ito, Jūdō and Kumakichi. Koto tells Jūdō to stop the war but there is nothing for it. On the previous night of the attack by the Government army, MURATA Shinpachi plays "La Marseillaise" on the concertina and all of the army dance to it. On the following morning, the final battle breaks out. In Tokyo, Toshimichi makes a speech at a national industrial fair but he becomes to feel restless and approaches the empty shelves for the exhibits from Kagoshima and removes the sign of "Kagoshima Prefecture" at last. At the headquarter of the army in Kagoshima, Jūdō bows his head to YAMAGATA Aritomo and leaves there. "My father respected Heaven and loves people. He loved people with all his might and that's why he was loved by many people so much". "This is not my husband. He is not a man like this. No!" The voice of Kikujirō overlaps. "I think you will understand why my mother says like this". At the end of the omnibus, young Takamori who is casually dressed and hunts an animal with his dog appears. (*) It means "Kill Saigō" or "Watch Saigō" but Toshiaki takes it as the former. (**) Personally, I think Ito's dissatisfaction is caused by the clothes of the statue because it should be full-dress uniform. Please see The Historical Background of Sego-don 19. Takamori strains himself by overwork. And ŌKUBO Toshimichi returns to Japan earlier than other members of the Iwakura Mission but the politicians from Tosa and Hizen tries to shun him as the mission could not revise any treaty. He visits Takamori who hasn't recovered yet and gives him a clock as a souvenir. He tells him about the Western countries and says he keenly feels how they are advanced. Takamori agrees with him but Toshimichi emphasizes that only those who have visited Western countries can know how he feels. He also says that's why the politicians from Tosa and Hizen look down on him. Takamori have a high opinion of them and it needs to argue what they should do for Japan more but Toshimichi insists that it needs to unite the country by force. Takamori tells him that if he thinks so, he should return to Kagoshima then he will govern Japan with the current members of the government. A few days later, Takamori returns to the administration but there is another problem in the government. Korea regards Japan as an outrageous country and breaks off relations with her. Takamori attempts to go to Korea to negotiate with her government but Toshimichi says Japan should leave it as it is. However Takamori cannot ignore the Japanese who live there and he opposes the view of Toshimichi. 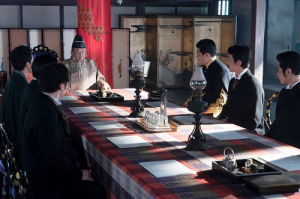 ETŌ Shinpei asks SANJŌ Sanetomi to dismiss Toshimichi and IWAKURA Tomomi both of whom are against them and Tomomi tells Taklamori to go to Korea at last. 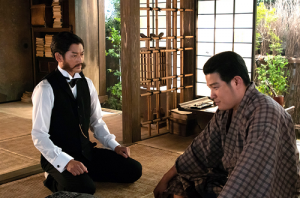 But Sanetomi becomes ill suddenly so Tomomi replaces him as Dajō Daijin and cancels Takamori's visit to Korea though Sanetomi once permitted Takamori to visit there. But there is a plot behind the scene. "You always say that you believe the people but I think it's too optimistic". Besides he says that he doesn't care about being called a coward and tells Takamori that he can feel bitter about him. Takamori says he cannot do such a thing. He also says it's his defeat and bows his head to O-Yū and leaves there. Toshimichi sheds tears. In 1904, SAIGŌ Kikujirō becomes a mayor of Kyoto City. He tells KAWAMURA Ryūjirō, a deputy mayor about his father. 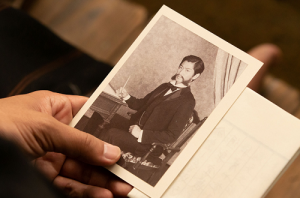 In 1868, he goes to Kagoshima with his mother-in-law Ito. He sees his father work at the farm and goes hunting in Kagoshima. At the same time ŌKUBO Toshimichi visits Kagoshima with IWAKURA Tomomi and talks with Takamori about Haihan Chiken, abolition of the domain system. Takamori suggests an idea of the Imperial Guards to him and goes to Tokyo accompanied by Kumakichi. The new government becomes complicated because of the confrontation between the politicians from Satuma and Chōshū and those from other domains as Tosa or Hizen. Takamori says if it cost money, the politicians should decrease their salary. He admires the spirit of simplicity and frugality and brings riceballs as lunch though others enjoy gorgeous meal. One night Toshimichi visits him in his tenement house and tells him that other politicians say it's hard to deal with him in this respect. Takamori then asks him why he tries to behave extravagantly in everything. Toshimichi says to him that Japan should not be made light of by the Western Powers. Toshimichi obtains the Imperial rescript of Haihan Chiken but it makes the politicians from Tosa and Hizen angry. But Takamori mediates between them. In Kagoshima, Hisamitsu sets off fireworks. And Takamori plans the Imperial visit to Western Japan includes Kagoshima. 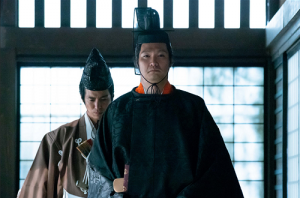 At Tsurumaru Castle, Hisamitsu in full dress tells him that establishing a new counrty is still at a developmental stage and worries about the scandals of some politicians. Hisamitsu tells him to follow through the plan and if he cannot do it, he should return to Satsuma. He also says it is the coming generation who bears the responsibility for the new country. It is decided that the Iwakura Mission will travel the US and Europe to revise the treaties and to watch the government, industries and infrastructures of each country. As Toshimichi and KIDO Takayoshi join the mission, Takamori, SANJŌ Sanetomi and the politicians from Tosa and Hizen lead the government. They reform many things while the mission go abroad and Takamori receives a letter from Tochimichi that says Japan should learn more things from Western countries.